With Valentine’s Day right around the corner, it’s the perfect time to talk about one of the most popular types of horse jewelry: horse jewelry with heart. 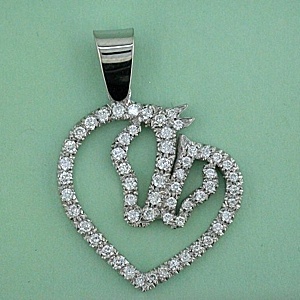 Pairing equestrian motifs with the familiar romantic heart shape results in some dazzling fine horse jewelry. We’d like to show you some of our favorite pieces! 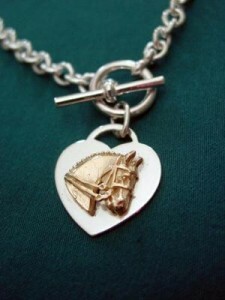 Check out this 14K Gold Dressage Horse Head on Sterling Silver Heart Necklace. This Tiffany-style heart tag necklace features an exquisitely detailed horse head in 14K gold. 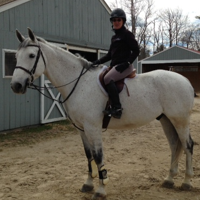 It’s a simple, classic, and elegant design that’s perfect for the horsewoman. 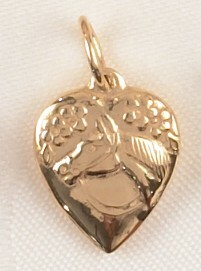 We also love this 14K Gold and Diamond Horse and Foal Heart Pendant. In this instance, we see a mare and foal nose-to-nose, the purest sort of love and affection. This diamond pendant is a dainty 1″ square, and features .75cwt of diamonds. If you’re looking for a great gift for Mom – this is it! 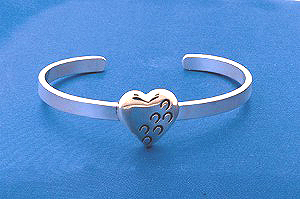 Here is a great sterling silver horse bracelet with a heart motif. The Hoofprints on Your Heart design is one of our most popular items: people love the simple, quirky charm of this bracelet. The bracelet is slightly adjustable, and will fit wrists from 6″ to 7.5″. Fine sterling silver jewelry made in the USA: perfectly priced to give as a gift – or to give to yourself! Finally, here’s one for the vintage horse jewelry fans! This 14K Gold Replica of a Victorian Horse Charm is dainty, elegant, and totally romantic. Look at the detail on this peace: the finely rendered horse, ears alert and eager, the bridle and reins, leaves rustling above. We’ve seen this charm worn on a horse charm bracelet or alone, as a pendant. Either way, it looks great!